I am running longish from the Store Saturday at 9am per the holiday/dance party set to take place later that night. I am hoping to get in 12-14, but I will run the majority of the run with the group who I suspect will be running 9-10. I defer to someone else to post a location for the Sunday run. BTW, who came out on top here? This was the Penn State Relays 3K in 2007 judging by the people I recognized in the facebook photo album this picture came from. I ran 8:48.68 (2nd) to beat Sam 8:50.46 (3rd). 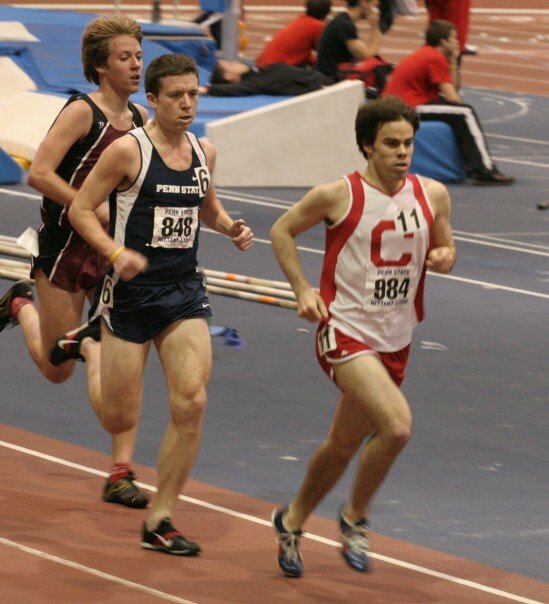 Later that season we both ran the Sykes-Sabok 5K and Sam got me 14:57.41 (11th) to 15:01.5 (13th). That was my 5K PR race. I remember it well. I think I'd prefer to go longer on Saturday also. On Saturday, let's try and be at the Store at 8:45am and ready to go at 9am. Outlaw and Predator need to work at 10am and they're starting their run at 8:30am and will then loop back. We'll all head north/west along the Towpath at 8:59:59am. We'll try for a 9-10 mile loop and then add on for people running more. Perhaps the Ernst/Pigtail Loop and a breakaway once we get to the Glover Arch Trail. Those wanting to run 9-10, will head south, those wanting 12+ will head north to RCP. I hope this make sense?